1. Steel Track — Floor, sidewall or top wall track. Nom 2 in. wide channel shaped with nom 1 in. long legs, formed from No. 25 MSG galv steel, secured with suitable fasteners spaced 24 in. OC. 2. Steel Studs — "H" shaped studs formed from No. 25 MSG galv steel having an overall depth of approximately 2 in. and flange width 1-3/8 in. 3. Gypsum Board* — Two layers of 1 in. thick gypsum wallboard liner panels, supplied in nom 24 in. widths. Vertical edges of panels friction fit into "H" shaped studs. 4. Wood Studs — For Bearing or Nonbearing Wall Rating — Nom 2 by 4 in. max spacing 24 in. OC. Studs cross braced at mid-height where necessary for clip attachment. Min 3/4 in. 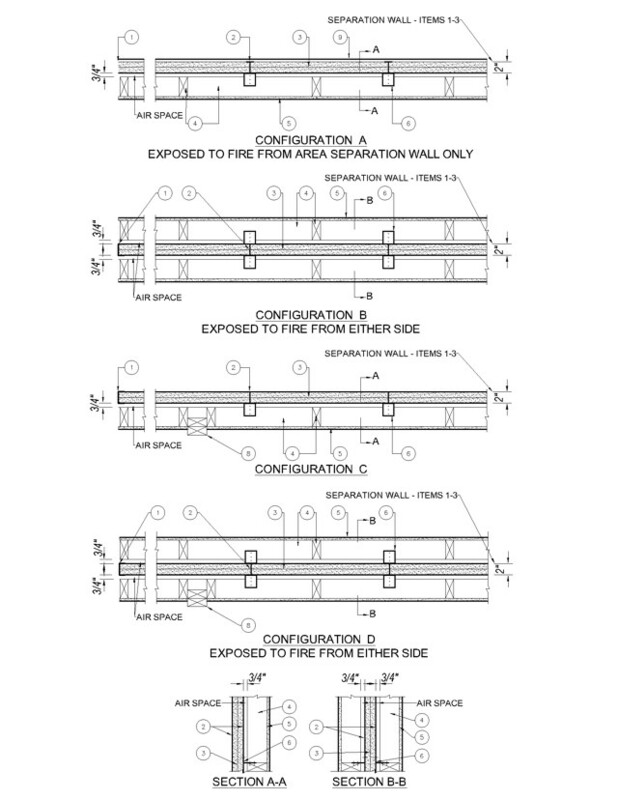 separation between wood framing and fire separation wall. Finish rating evaluated for wood studs only. 4A. Steel Studs — (As an alternate to Item 4, not shown) — For Bearing Wall Rating — Corrosion protected steel studs, min No. 20 MSG (0.0329 in., min bare metal thickness) steel or min 3- 1/2 in. wide, min No. 20 GSG (0.036 in. thick) galv steel or No. 20 MSG (0.033 in. thick) primed steel, cold formed, shall be designed in accordance with the current edition of the Specification for the Design of Cold-Formed Steel Structural Members by the American Iron and Steel Institute. All design details enhancing the structural integrity of the wall assembly, including the axial design load of the studs, shall be as specified by the steel stud designer and/or producer, and shall meet the requirements of all applicable local code agencies. The max stud spacing of wall assemblies shall not exceed 24 in. OC. Studs attached to floor and ceiling tracks with 1/2 in. long Type S-12 steel screws on both sides of studs or by welded or bolted connections designed in accordance with the AISI specifications. Top and bottom tracks shall consist of steel members, min No. 20 MSG (0.0329 in., min bare metal thickness) steel or min No. 20 GSG (0.036 in. thick) galv steel or No. 20 MSG (0.033 in. thick) primed steel, that provide a sound structural connection between steel studs, and to adjacent assemblies such as a floor, ceiling, and/or other walls. Attached to floor and ceiling assemblies with steel fasteners spaced not greater than 24 in. O.C. Studs cross-braced with stud framing at midheight where necessary for clip attachment. Min 3/4 in. separation between steel framing and area separation wall. Finish rating has not been evaluated for Steel Studs. 4B. Steel Studs — (As an alternate to Items 4 and 4A, for use in Configuration B only, not shown) — For Nonbearing Wall Rating — Channel shaped, fabricated from min 25 MSG corrosion-protected steel, min 3-1/2 in. wide, min 1-1/4 in. flanges and 1/4 in. return, spaced a max of 24 in. OC. Studs to be cut 3/8 to 3/4 in. less than assembly height. Top and bottom tracks shall be channel shaped, fabricated from min 25 MSG corrosion-protected steel, min width to accommodate stud size, with min 1 in. long legs, attached to floor and ceiling with fasteners 24 in. OC max. Studs cross-braced with stud framing at midheight where necessary for clip attachment. Min 3/4 in. separation between steel framing and area separation wall. Finish rating has not been evaluated for Steel Studs. 5. Gypsum Board — Classified or Unclassified — Min 1/2 in. thick, 4 ft wide, applied horizontally or vertically. Wallboard attached to wood studs (Item 4) with 1-1/4 in. long steel drywall screws spaced 12 in. OC. Wallboard attached to steel studs (Item 4A or 4B) with 1 in. long Type S steel screws spaced 12 in. OC. Vertical joints located over studs. Horizontal joints shall be butted tight to form a closed joint. As an option, joints covered with paper tape and joint compound. As an option, screw heads covered with joint compound. 5A. Plywood Sheathing or OSB — (not shown) — As an alternate to Item 5, Min 1/2 in. thick plywood or OSB applied horizontally or vertically to wood or steel studs. Vertical joints located over studs. Horizontal joints shall be butted tight to form a closed joint. Fastened to studs with nails or screws of sufficient length, spaced 12 in. OC. Joints and fastener heads are not required to be treated. Aluminum clips shall be spaced as described in Item 6. 5B. Batts and Blankets* — (not shown) — As an alternate to Items 5 and 5A, Glass fiber or mineral wool insulation, min. 3-1/2 in. thick, placed to completely fill the wood or steel stud cavities. When Batts and Blankets are used in place of Items 5 and 5A, the max height is 54 ft and the aluminum clips (Item 6) shall be spaced a max of 5 ft OC vertically. See Batts and Blankets (BKNV) category in the Building Materials Directory and Batts and Blankets (BZJZ) category in the Fire Resistance Directory for name of Classified Companies. 5C. Wall and Partition Facings and Accessories* — (not shown) — As an alternate to Items 5, 5A and 5B, 4 ft wide panels, applied vertically. Panels attached to wood studs (Item 4) with 1-5/8 in. long steel drywall screws spaced 16 in. OC. Vertical joints located over studs. Joints covered with paper tape and joint compound. As an option, screw heads covered with joint compound. NATIONAL GYPSUM CO — Type SoundBreak Gypsum Board. 6. Aluminum Clips — Aluminum angle, 0.049 in. thick, 2 in. wide with 2 in. and 2-1/2 in. legs. Clips secured with Type S screws 3/8 in. long to "H" studs and with 1-1/4 in. long screws to wood framing or steel framing through holes provided in clip. 6A. Clip placement for separation walls up to 23 ft high: Space clips a max of 10 ft OC vertically between wood or steel framing and "H" studs. 6B. Clip placement for separation walls up to 54 ft high: Space clips as described in Item 6A for upper 24 ft. Remaining wall area below requires clips spaced a max of 5 ft OC vertically between wood or steel framing and "H" studs. 6C. Clip placement for separation walls up to 66 ft high: Space clips as described in Item 6A for upper 24 ft, space clips as described in Item 6B for middle 30 ft. Remaining wall area below requires clips spaced a max of 39 in. OC vertically between wood or steel framing and "H" studs. A. Item 4, above — Wood Studs — Shall be spaced 16 in. OC. B. Item 5, above — Gypsum Board — Min. weight 1.5 psf. Shall be applied vertically and attached to studs with 1-1/4 in. long steel drywall screws spaced 16 in. OC. Joints and screwheads shall be covered with paper tape and joint compound. C. Item 6, above — Aluminum Clips — Spaced a max of 10 ft OC vertically. D. Batts and Blankets* - The cavities formed by the wood studs shall be friction fit with 3-1/2 in. thick fiberglass insulation batts, min. 0.80 pcf. See Batts and Blankets (BKNV) category in the Building Materials Directory and Batts and Blankets (BZJZ) category in the Fire Resistance Directory for name of Classified Companies. E. Max Height of Separation Wall is 23 ft.
F. The STC rating applies to Configuration B only. G. Steel Studs (Items 4A, 4B), Plywood Sheathing or OSB (Item 5A and Item 9) and Batts and Blankets (Items 5B) not evaluated as alternatives for obtaining STC rating. B. Item 5C, above — Wall and Partition Facings and Accessories* — Type QuietRock QR-510 panels shall be installed. D. Batts and Blankets* - The cavities formed by the wood studs shall be friction fit with 3-1/2 in. thick fiberglass insulation batts, min. 1.0 pcf. See Batts and Blankets (BKNV) category in the Building Materials Directory and Batts and Blankets (BZJZ) category in the Fire Resistance Directory for name of Classified Companies. A. Item 4, above - Wood Studs - Shall be spaced 16 in. OC. B. Item 5C, above - Wall and Partition Facings and Accessories* - Type QuietRock QR-525 panels shall be installed as described in Item 5C. C. Item 6, above — Aluminum Clips - Spaced a max of 10 ft OC vertically. D. Batts and Blankets* — The cavities formed by the wood studs shall be friction fit with 3-1/2 in. thick fiberglass insulation batts, min. 1.0 pcf. See Batts and Blankets (BKNV) category in the Building Materials Directory and Batts and Blankets (BZJZ) category in the Fire Resistance Directory for name of Classified Companies. 8. Non-Bearing Wall Partition Intersection — (Optional) Two nominal 2 by 4 in. stud or nominal 2 by 6 in. stud nailed together with two 3in. long 10d nails spaced a max. 16 in. OC. vertically and fastened to one side of the minimum 2 by 4 in. stud with 3 in. long 10d nails spaced a max 16 in. OC. vertically. Intersection between partition wood studs to be flush with the 2 by 4 in. studs. The wall partition wood studs are to be framed with a second 2 by 4 in. wood stud fastened with 3 in. long 10d nails spaced a max. 16 in. OC. vertically. Maximum one non-bearing wall partition intersection per stud cavity. Non-bearing wall partition stud depth shall be at a minimum equal to the depth of the wall. 9. Plywood Sheathing or OSB — (Optional) — Min 1/2 in. thick plywood or OSB applied horizontally or vertically to "H" studs on area separation wall side of Configuration A or Configuration C. Vertical joints located over studs. Fastened to "H" studs with screws of sufficient length, spaced a maximum of 12 in. OC. 10. Gypsum Board* — As an alternate to Item 5 - Min 5/8 in. thick, min. 6 in. wide batten strips, applied on both sides of Steel Studs (Item 2) and horizontal back to back Steel Track (Item 1). Min. 5/8 in. thick, min. 3 in. wide batten strips applied on both sides of single Steel Track (Item 1) at perimeter of assembly. Batten strips secured to studs with 1-1/4 in. long Type S steel screws spaced 12 in. OC. Batten joints shall be butted tight to form a closed joint. As an option, entire sheet of gypsum board may be used in lieu of the battens. Clip placement as in item 6, 6A, 6B, or 6C. NATIONAL GYPSUM CO — Type FSW-3.